I'm looking at that list and what they seem to have in common is a primarily web-based experience and being relatively small, yet successful startups. But what else exists is a commitment to a great customer experience, whether online or in the store. These are companies I would feel comfortable working for, not just being a customer - okay, maybe not the big corporate experience of Target - but you get the idea. I'm trying something new as well - for the next few weeks, I'm going to look through my blog and Facebook comments and pick some lucky people to get $10 off an eSalon product order. That means you could try one of eSalon's awesome styling products at a substantial discount! 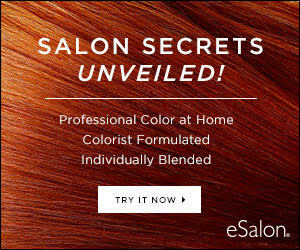 Comment on my blog or my Facebook page and share your coloring experiences in detail and tell me if you've tried eSalon in the past and I'll pick a few people to get $10 off a product order. In the meantime, if you're ready to try eSalon hair color for the first time, let me refer you and get $10 off your first order! Subscribe to their service and your first order is just $9.95 plus shipping!